Please read on to see what other volunteers and schools have to say about Stepping Stones’ English teaching volunteer programs! Inspired by the distinctive study experience, his initial curiosity turned into an unprecedented learning passion. After completing the 2012 summer program, from September onwards, he commuted by himself to the community center every Saturday to attend Stepping Stone’s newly launched After-school Tuition Program. Encouraged by Stepping Stones’ volunteers, he was able to step outside of his comfort zone to communicate in English. His Mom even sectioned out a small space at home for him to practice his spoken English. By the time he graduated from primary school, he was able to score 85+ in his English tests. Although he had to return to his hometown to continue his middle school education, he is currently ranking top 3 in his class and just scored 96 points in his English mid-term exam this semester! Witnessing the dramatic effect on her own son, Li Zhengfang volunteered to help support Stepping Stones’ classes, and has recently become a full-time staff in the village committee to coordinate the English program, which helps migrant children like her son to gain valuable experiences that they would not likely get elsewhere. “The current English curriculum in China emphasizes writing and reading but pays little attention to listening and speaking. Stepping Stones provides the service that we most need help with. I think Stepping Stones’ volunteers enjoy the interaction with our teachers. We started a program called Discussion Time last semester, in which our teachers practice oral English with Stepping Stones’ volunteers for about 20-30 minutes per week. The program has greatly helped the teachers.” – Pang Yuyi, Hua Hong School, Minhang, Shanghai. 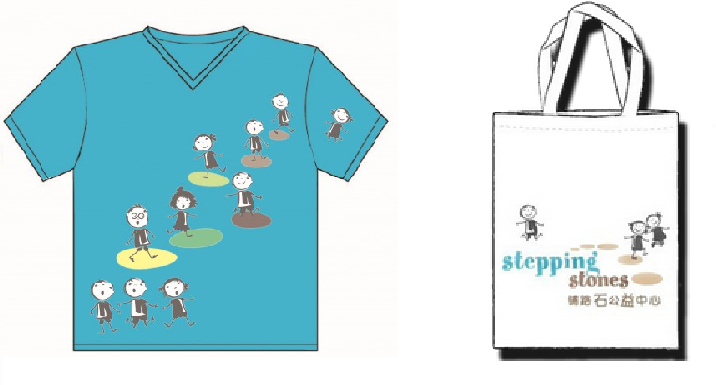 “Stepping Stones is a great project. It offers our students the opportunity to experience western culture and to improve their oral skills. Stepping Stones’ impact on the students is that they have become braver and more confident to speak, and more open. When I have doubts about pronunciation or grammar, I also ask for help from the volunteers.” – Zuo Yan, Teacher, Hua Hong School, Minhang, Shanghai. “Stepping Stones’ program’s impact on me is that I have the opportunity to communicate face to face with foreigners. In this way, my oral English has improved; it has made me braver to communicate in English. The impact on the students is that students have become more active, because the classes are very lively.” – Guo Jia, Teacher, Tangsi School, Pudong New Area, Shanghai. “On behalf of these children, I would like to thank you for all you’ve done for them. Though they are not rich, with the care of the leaders and the society, I believe they will grow up healthily, and will repay the society with more love.” – Hao Lingyu, Math Teacher, Tangsi Primary School, Pudong New Area, Shanghai. “Volunteer teachers encourage students to speak and express themselves, so the classes with a volunteer teacher are more active in the English lessons than those without.”– Local English teacher, primary school in Minhang, Shanghai. “Volunteering broadens students’ vision. Volunteers bring fresh knowledge from the outside world and bring it to the students. This is what is lacking in our regular school classes. The volunteers raise students’ interest in English and make them like the subject more.” – Liu Jing, Teacher, Hua Bo Li Xing Hang, Minhang, Shanghai. “On behalf of the school, we need to send a big thank you to the volunteers of the Stepping Stones program for all the excellent impact they have on our students in the field of English learning.” – Principal, primary school in Pudong, Shanghai. “We really like the Stepping Stones voluntary English teaching programme at our school. Students who join the programme become more interested in learning English. They like your programme and the volunteers that come to our school. We hope to see you again next school term.”– Director of Studies, primary school in Putuo, Shanghai. “Stepping Stones’ volunteers are very good to us. They are very kind, friendly, and “tender” when they teach us. If we make a mistake, they immediately correct us. The teachers also have very special ways to teach. I like to answer questions. If we get the answer right, they will give us sweets, or they smile and say : you’re great. […] The foreign teachers do not teach us like adults normally teach children. Instead, they communicate with us like other children do. They are very nice to us. They play with us, and while we are playing, we are also learning a lot. […] My grade used to be just average. After taking the English program, I have a new understanding of English. Now my English grade is top-3 in class. I also help others if they do not understand a question.” – A student in Minhang, Shanghai. “These English courses correct my pronunciation, create a relaxed studying atmosphere, and make English easier. I have improved my English grade from 80 to 90. My greatest improvements are in listening and writing.” – A student in Pudong New Area, Shanghai. “English has become easier after taking the oral classes. We now find it is not so hard to communicate with foreigners, and they are actually easy to get along with. The impact on me is that I would like to study abroad if it is possible. My dream countries are the US and the UK, because they speak English, and the US has the most advanced technology.”– A student in Pudong New Area, Shanghai. “I really like when the teacher comes. I feel very happy. Because they are foreigners…I have not seen foreigners in China. The teacher taught us new words and sentences, I learned a lot .” – A student in Jiashan, Zhejiang. “It took quite a bit of encouragement from friends to get me to the volunteer orientation session at Stepping Stones two years ago. I do not have children, it has been a long time since I was in a classroom and I was terrified of the mischief that 50 children might get up to. […] The orientation session convinced me that there is an urgent need for english speakers in migrant schools and that I could positively impact the children’s results at school. Stepping Stones provide a lot of very practical resources to develop a lesson plan and prepare for the classes. I have been very impressed with the quality of support and professionalism of all the staff at Stepping Stones. The children were in fact very well behaved, they were very excited to see us each week and I saw improvements in all their abilities over the course of each term. I usually left class smiling and made lots of new friends with co-teachers from many different countries. […] Most importantly I felt like I was actually making a contribution to local peoples lives. It is easy to get caught up in an expat bubble in Shanghai. Stepping Stones provided a link for me to understand a little more about what life is really like for many local people.” – Claire, volunteer, Nanshu School, Zhejiang. 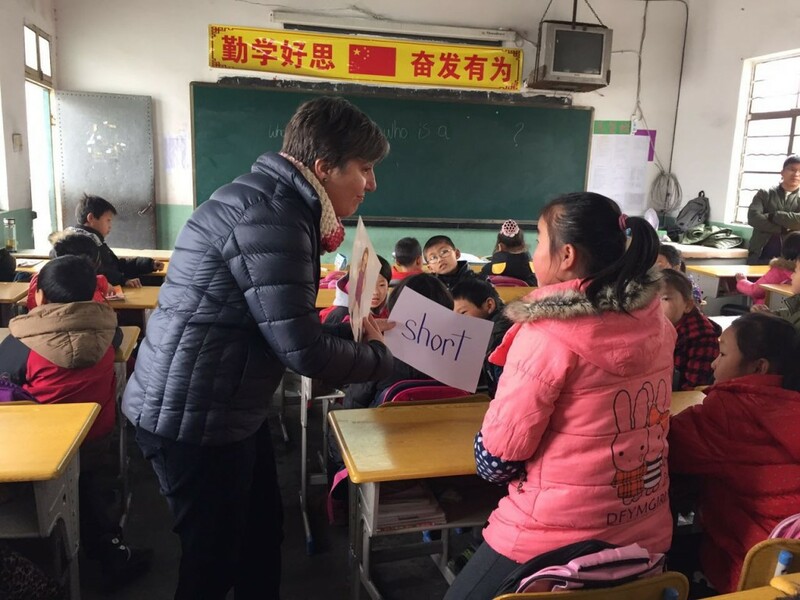 “When I was approached to be part of this new, innovative scheme to provide children in more remote parts of China with English lessons taught by native speakers, I didn’t hesitate. I had loved teaching with Stepping Stones when I lived in China and now my week would provide me with forty minutes where I felt like I was back there. […] I knew teaching via videolink would be challenging at times but any problems that arose were not insurmountable. The biggest challenges were the variable Internet speed and not being physically present in the classroom to move amongst the students. The Internet speed varied from week to week. Some weeks there were no problems, whilst at other times there was a sound delay, which meant I needed to adapt my teaching to allow for this. Like all classrooms where I have taught in China, the students were eager to learn and well behaved. They sat in the same seat each week, so by having a seating plan on the wall above my computer, I was able to get the attention of any students I felt were becoming distracted. […] Each week, Ross at Stepping Stones provided me with a PowerPoint lesson. This formed the basis of my lesson. I found the student’s attention was highest when I was on full screen, so I added real objects to illustrate teaching points and used a small white board for incidental teaching or to play games. My lessons were revision of work already taught by the school’s English teacher. I found the students knew the content well but needed practice with pronunciation. This improved greatly over time along with the student’s confidence in participating and interacting with me. […] I have enjoyed this experience very much. It can be challenging, and you need to be adaptable, as you don’t have the same control over all the variables as you do in the classroom. 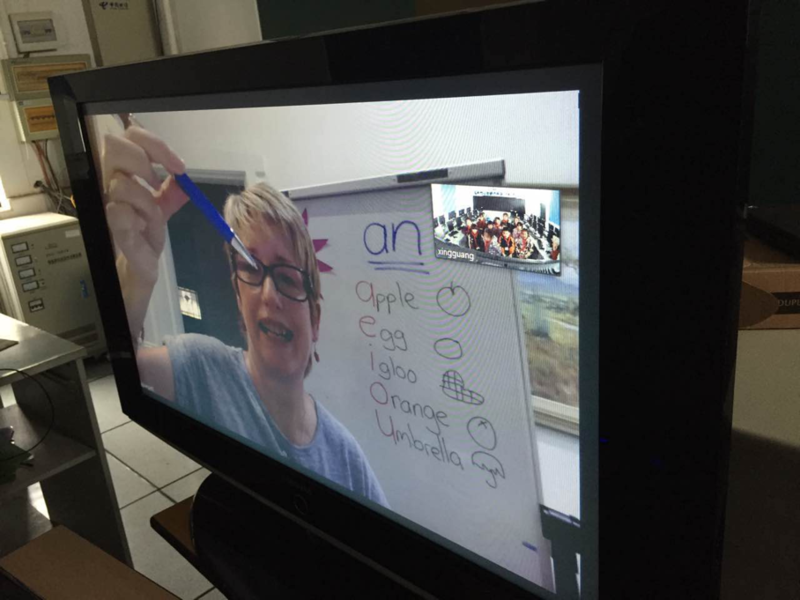 It has been wonderful seeing the beaming smiles of the students as they arrive and leave our virtual classroom.” – Nola Clark, videolink volunteer, Fengxian, Shanghai. “These kids really make my day! Since I’m not a native speaker , I wasn’t sure if I could teach the Chinese students, but I must say I’m so glad that I started doing this. I feel my English level is good enough and these kids give me so much back every week. I’m always happy after spending the time with them all.” -Randi Lur, volunteer, Shanghai. “I didn’t have a chance to say thank you for the opportunity to enjoy this marvellous experience at the school. I enjoyed and learned a lot this year with my colleagues and my students. I miss them already.”– Claudia Souza, volunteer, Shanghai. “Good luck with Stepping Stones. We really loved working with those kids. It’s a great organization.” – Kellie & Greg Schmitt, volunteers, Shanghai. “I was volunteering at Aixin School in Minhang before it closed. Unfortunately my involvement was short-lived as I left Shanghai very unexpectedly for personal reasons. My experience with migrant schools inspired me to make a career change and I am now back in school to get properly certified as a ESL teacher. You are doing excellent work and have my utmost admiration.”– Marianne Rowland, volunteer, Aixin School, Minhang, Shanghai. “It has always been difficult for me to say, whether I have encouraged interest for the language or they have encouraged me to teach better. Ideas don’t come around in vacuum unless we have purpose to meet. So are these children being purposeful for our interests. Hats off to Stepping Stones for the initiative. It is so much pleasure to work with you all.”– Vimala, volunteer, Tangsi Primary School, Shanghai.